Tineke Verkade of Homeopathic Farm Support won Rural Women NZ’s Enterprising Rural Women Award. Tineke was the North Island winner. 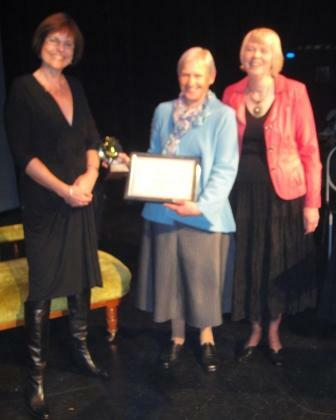 She is pictured (middle) with Judy Bailey who presented the award and Rural Women national president Margaret Chapman. Flooded roads prevented the South Island winner, Tracey Robinson of Cosy Toes from attending last night’s award announcement at the Oamaru Opera House.. When the two finalists were announced, there was some controversy over the North Island award going to a homeopathic company. But judges were not looking so much at what a business did as how, and how well, it was run. Listening to Tineke speaking last night, no-one could doubt her passion and commitment. 1. What’s distinctive about someone with a variation in the MC1R gene? 3. Who won this year’s Prime Minister’s Awards for Literature? 4. What is a titipounamu? 5. Name the national presidents of: Federated Farmers, Rural Women NZ and NZ Young Farmers. Paul Tremewan got two right, a bonus for originality in his answer to #1 and another for humour in his last answer. If his answer to #2 is satirical he’ll get a bonus for that too. Paul L gets a bonus for lateral thinking and another for humour. David W got 2 1/3 plus a bonus for teaching me something with the full answer to #1. PDM – Mike Peterson chiars what was Meat & Wool NZ and will soon be just Meat NZ. But you can have a bonus for humour. Rural Women president Margaret Chapman is upset that the Ministry of Rural Affairs is to be axed. Rural issues extend well beyond agriculture, and in the past the Minister of Rural Affairs has had an important role to play in monitoring and overseeing a wide range of policies affecting rural communities. Absorbing the Rural Affairs role into the Ministry of Agriculture threatens to dilute its effectiveness and lead to policies that fail to take into account broader rural needs at a time when vibrant agricultural businesses and service industries rely on strong communities to support them. “It is vital to provide for the needs of the rural workforce to continue to grow this important sector in the New Zealand economy,” says Ms Chapman. I agree that rural issues extend well beyond agriculture but we don’t need a separate Ministry with all the associated costs to recognise that. The Ministry may have ensured the rural perspective was factored into many policies. But that doesn’t mean they wouldn’t have been anyway or that the Ministry of Agriculture won’t be at least as effective an advocate on rural issues. And the rationalisation needn’t stop with Rural Affairs. Kiwi Polemicist has a list of 60 Ministries. That seems excessive so given the dire economic outlook a cull would be in order. Women’s Affairs, Senior Citizens and Youth Affairs would be good places to start, not because there aren’t issues which affect people in these groups, but I don’t believe they need separate ministries to address them. I’d also be tempted to axe the Ministry of Disability Issues or merge it with Health. The then Minister of Social Welfare, Roger Sowrey, was asked about a separate ministry of disabilities at an IHC conference in the late 1980s. He replied that while a dedicated Ministry ensured that an area received attention it also provided other Ministries with an excuse to ignore the issues because they were another Ministry’s business. That’s a valid point. All Ministries should have regard for the affect their policies on everyone and if they did we’d get better policy at a lower cost.